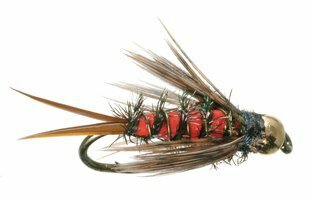 Bead Head Nymphs are the workhorse flies of many trout anglers and for good reason. The added weight keeps them riding low in the water column where feeding lanes exist. In most cases, all of the best producing traditional nymph and pupa patterns are tied as bead heads in our recipe library. Pictured here is Bloody Mari a bead head general purpose nymph created by Daryl Smoot. Metal beads and coneheads for tying are available in standard color choices of gold, black nickel, copper, silver and glow-in-the-dark. The same color choices are also available in tungsten beads that weigh twice as much as brass beads the same size. Additionally there are also non toxic brass beads painted with a baked on enamel finish in bright salmon egg colors. Bead sizes range from as small as 5/64” or 2.0mm to as large as 5/32” or 3.8mm. Coneheads range in size from as small as 5/32” or 3.8mm to as large as 1/4” or 6.6mm. Biot Epoxy Stone ( Golden Color Scheme) Pattern Recipe: Hook- TMC2312, Antennae- Two brown goose biots tied split, Head- Gold Bead, Thorax- Dubbed dark hares ear, Wingcase- Brown epoxy, Legs- Natural partridge barbs, Abdomen- Light brown Paxtons Buggy Nymph, Tail- Two brown goose biots tied split. Copper John Bead Head ( Copper Color Scheme) Pattern Recipe: Hook TMC5262, Thread- Black 6/0, Head- Gold Bead, Thorax- Wrapped peacock hurl, Wingcase- Brown Thin Skin on top of Pearl Flashabou, Legs- Brown natural Hungarian Partridge, Abdomen- Wound copper wire, Tail- Two dark brown turkey boits tied split. Caddis Pupa Bead Head (Cream Color Scheme) Pattern Recipe: Hook- TMC3769, Thread- Cream 6/0, Head- Gold Bead, Antennae- Mottled brown hen hackle barbs slightly longer that hook tied rear facing, Legs- Mottled brown hen hackle tied as sparse collar, Abdomen- Dyed cream rabbit dubbing, Tail- No tail. Hares Ear Bead Head Pattern Recipe: Hook TMC3761, Thread- Tan 6/0, Head- Gold bead, Thorax- Dubbed hares ear, Wingcase- Turkey quill section, Abdomen- Dubbed hares ear, Ribbing- Flat gold tinsel, Legs- Hares ear fibers from abdomen, Tail- Brown partridge barbs. Pheasant Tail Bead Head Pattern Recipe: Hook- TMC3761, Thread- Brown 6/0, Thorax- Wrapped peacock hurl, Wingcase- Ringneck pheasant tail barbs, Legs- Ringneck pheasant barb tips, Abdomen- Wrapped Ringneck tail barbs, Ribbing- Fine copper or gold wire, Tail, Ringneck pheasant tail barbs. Prince Nymph Bead Head Pattern Recipe: Hook-TMC3761, Thread- Black 6/0, Head- Gold bead, Legs- Wrapped brown hackle tied as sparse collar, Wings- Two white turkey biots, Abdomen- Wrapped peacock hurl, Ribbing- Flat gold tinsel, Tail- Two brown turkey biots tied split. Quasimodo Pheasant Tail Bead Head Pattern Recipe: Hook- TMC2488H, Thread- Brown 6/0, Head- Copper bead, Thorax- Wrapped peacock hurl, Wingcase- Ringneck pheasant tail barbs, Legs- Ringneck pheasant barb tips, Abdomen- Wrapped Ringneck tail barbs, Ribbing- Fine copper or gold wire, Tail, Ringneck pheasant tail barbs. Rubber Legged Stone Bead Head ( Golden Color Scheme) Pattern Recipe: Hook- TMC300, Thread- Brown 6/0, Head- Gold Bead, Antennae- two ginger goose biots tied split, Thorax and Abdomen- 50% Golden brown HareTron, 50% mixed color Angora Goat, Wingcase- Mottled turkey quill sections, Ribbing- Transparent amber Swannundaze, Tail- Two ginger goose biots tied split. Rubber Legged Squirrel Nymph Bead Head Pattern Recipe: Hook- TMC5262, Thread- Black 6/0, Head- Gold bead, Thorax- 50% Dubbed red fox squirrel mixed with 50% fox tan Antron, Legs- Mottled golden brown hen saddle tied as a sparse collar across the length of the abdomen, Abdomen- 50% Dubbed red fox squirrel mixed with 50% fox tan Antron, Ribbing- Oval gold tinsel, Tail- Red fox squirrel back hairs. Zug Bug Bead Head Pattern Recipe: Hook- TMC376, Thread- Black 6/0, Head- Gold bead, Thorax- Wrapped peacock hurl to include abdomen, Wingcase- Mallard Wood duck section, Legs- Brown hackle barbs, Abdomen- Wrapped peacock hurl, Ribbing- Single flat strand of silver Mylar, Tail- Peacock sword. Cased Caddis Tungsten Bead Head Pattern Recipe: Hook- TMC200R, Thread- Black 6/0, Head- Black Tungsten Bead, Thorax- Light olive dubbing behind black dubbing, Hackle- Brown palmered over abdomen and trimmed short, Abdomen- Wrapped Peacock herl Ribbing- Fine gold wire, Tail- No tail. Gold Ribbed Hares Ear Tungsten Bead Pattern Recipe: Hook TMC3761, Thread- Tan 6/0, Head- Gold tungsten bead, Thorax- Dubbed hares ear, Wingcase- Turkey quill section, Abdomen- Dubbed hares ear, Ribbing- Flat gold tinsel, Legs- Hares ear fibers from abdomen, Tail- Brown partridge barbs. Copper John Tungsten Bead Head ( Copper Color Scheme) Pattern Recipe: Hook TMC5262, Thread- Black 6/0, Head- Gold Tungsten Bead, Thorax- Wrapped peacock hurl, Wingcase- Brown Thin Skin on top of Pearl Flashabou, Legs- Brown natural Hungarian Partridge, Abdomen- Wound green wire, Tail- Two dark brown turkey boits tied split. Z- Wing Caddis Tungsten Bead Head (Olive Color Scheme) Pattern Recipe: Hook- TMC2457, Thread- Olive 6/0, Head- Gold Tungsten Bead, Thorax- Wrapped Peacock hurl, Wing- Light olive colored Z-Lon, Abdomen- Olive Antron dubbing, Back- Dark turkey quill section, Ribbing- Olive thread, Tail - No tail.